Best Kept Secret On The Beach! 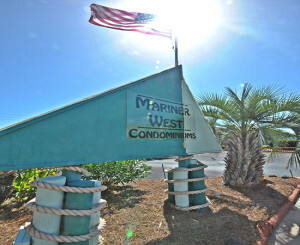 Mariner West has a great family atmosphere and is centrally located on Panama City Beach, Florida. Book your Vacation accommodations’ here for family vacations, reunions, weddings, or a get a way weekend. Every condo is beach front and has a beautiful View of the Gulf of Mexico. Each condo sleeps six, comes with a fully equipped kitchen, laundry room and has free cable TV, HBO and high speed internet. Mariner West also feature a tennis court a shuffle board court, a pool room, a meeting room for groups to gather and gas grills outside for all of our guest’s use. Lounge your days away by our beachside pool or on the world’s most beautiful beach. Relax in the warm waters of the Gulf of Mexico or just stroll along the beautiful White sandy beaches. When it is time to dine out, dance the night away or spend an afternoon shopping, choose from a Variety of World class restaurants, night clubs and unique beach shops. We have had families staying with us for generations. It is a quiet, and Clean and convenient location. At least 80% of our condos have been updated and 50% have been completely remodeled. Make Mariner West your fantasy getaway home away from home.